All her life, Serena Talbot has been in love with the handsome boy next door, Sir Paul Garside. She always eagerly looks forward to Paul’s visit to her family over the Festive Season, even if he usually brings along his dark, sardonic friend Lord Hallam. This year, Serena is determined that Paul’s kiss under the mistletoe will lead to a proposal. Even if she has to enlist every ounce of Christmas magic she can get her hands on to make that happen. But the mistletoe gets it wrong! When Serena slips a sprig of mistletoe from the village kissing bough under her pillow, it’s not Paul who turns up in her dreams as the man she’s going to marry, but brooding, intense, annoying Giles Farraday, Marquess of Hallam. Still more annoying, once everyone arrives for the annual Christmas house party, she can’t stop watching Giles, and thinking about Giles. And kissing Giles, whether there’s mistletoe about or not. Now Paul wants to marry her, and Giles wants to seduce her–and Serena has a bone to pick with the old wives who came up with all this superstitious nonsense in the first place. A Christmas of confusion lies ahead! 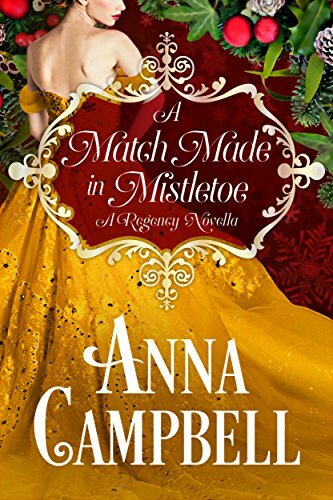 Will mistletoe magic lead the way to a happy ending?